Rabbits are known for their powerful back legs, which allow them to move quickly over short distances. However, rabbits can also use their powerful back legs to kick their human companions, causing injury to the humans or themselves. Kicking in rabbits is a behavior that many rabbit owners observe. Owners should understand that kicking is an indication of how secure a rabbit feels when being held. Proper handling is the best option to help prevent this unwanted behavior. Rabbits may kick when they are running around in an open area or when they are being held by a human companion. Generally, rabbits will kick when they are allowed to run in a large area because they feel happy and content with their environment. This positive behavior is especially evident in caged rabbits that are provided supervised exercise time. On the other hand, when rabbits kick while being held, they are trying to communicate that they feel insecure. To feel secure when being handled, rabbits need to be positioned with their hind feet squarely underneath them. If rabbits are held in a manner that does not provide adequate support and balance, they may kick violently until they are free from the handler. This kicking can easily scratch the handler, as well as injure the rabbit. A rabbit’s spine is extremely delicate and can be damaged by violent kicking. A damaged spine can cause pain, fractures, or paralysis. Stress will also cause a rabbit to kick. When a rabbit is scared it may kick to escape an uncomfortable situation. Owners should try to handle rabbits only in an environment that is as calm as possible. Regular handling is a major way to help prevent kicking. Handling a rabbit daily will help it become comfortable with being held and touched by humans. Owners should also use a calm, soothing voice. Sudden sounds or movements may startle a rabbit and cause it to kick. 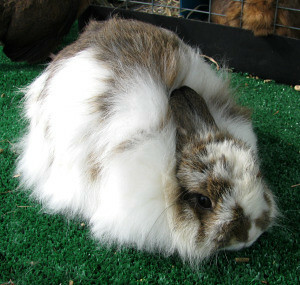 In addition to understanding the proper way to hold a rabbit, owners can decrease their chance of injury by regularly trimming the rabbit’s nails. Watch “How to Trim Rabbit Toenails” for more information on how to properly and safely prevent long nails in rabbits.